APPLICATIONS: Scupper Drains - for leak free drainage at roof sidewalls. Scupper Drains are designed to provide efficient drainage with secure flashing termination at the difficult roofing/sidewall junction. Portals Plus Scupper Drains are all manufactured of heavy castings. An important feature is the removable bolted flashing clamp on the face. 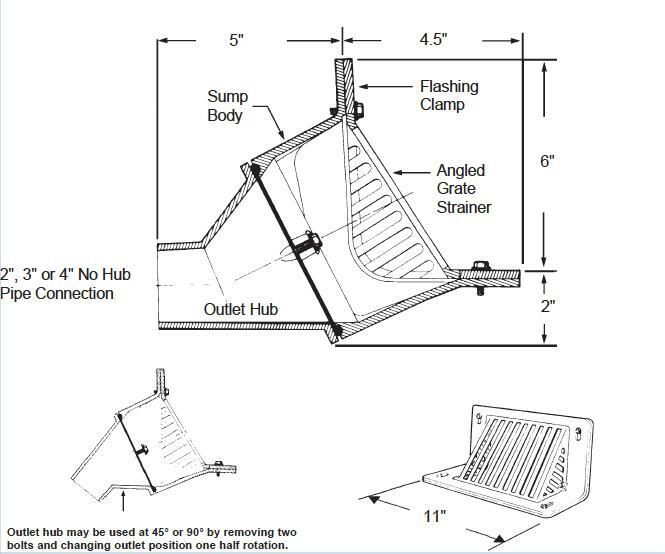 This flashing clamp allows the roofing membrane and flashing plies to be securely compressed and sealed at this low point of the roofing system. The outlet of the Scupper Drain can be positioned in any of three directions- horizontal, vertical, or 45 degrees. When used in conjunction with interior roof drains and a sloped deck or tapered insulation, Scupper Drains can used as overflow drains. Portals Plus cast aluminum Scupper Drains are the solution to leaky fabricated sheet metal scuppers. 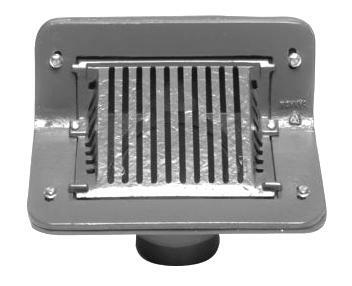 SPECIFICATION: Scupper Drain consists of a removable epoxy coated cast aluminum integral flashing clamp with angled grate, with a free area of not less than 17.60 sq.in. Drain sump body is 6" tall by 11" wide, epoxy coated cast aluminum alloy. All scupper drains include a removable cast aluminum alloy no hub-outlet connecter extension. Uses 4" EPDM Connector, not included.